Frankie the flamingo agrees probably anyone can be an artist but is very pleased that after Cath sketched her growing up she got Jon Evans on board to depict her as the suave cool flamingo she has grown up to be. 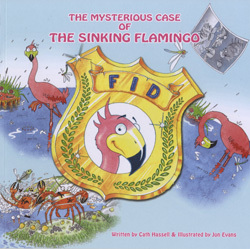 Get your very own copy of ‘The mysterious case of the sinking flamingo’! You can buy the ‘The mysterious case of the sinking flamingo’ via Amazon, or email us directly if you are a school, or want to buy multiple copies. Frankie the Flamingo’s first book review! 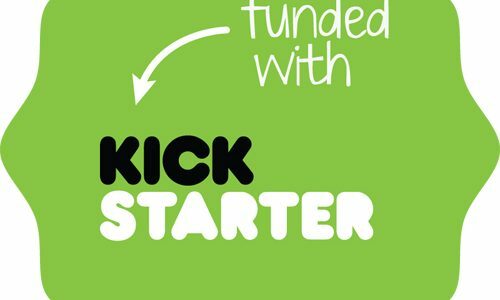 Adam Vaughan, an architect specialising in low-energy design, and a sponsor for the ‘Frankie the Flamingo’ Kickstarter campaign, has written a review of The Mysterious Case of the Sinking Flamingo for Tracing Green. On behalf of the Flamingo Investigation Department I (Denzil the Dragonfly) want to send out massive thanks to the loads and loads of amazing people and organisations who helped make ‘The mysterious case of the sinking flamingo’ a reality.